Editor’s Note: In the mid-section of this Review, Fred devised a most analytical narrative in comparisons of several makes of power cables. While the information contained can be a little dry in readability, it is nevertheless an excellent resource to return to repeatedly later on. The last section titled, “Long Term Listening Impressions”, however, is one of the most insightful writing I’ve read on power cables in a long time. Inevitably, all cables will alter a signal to some degree. Capacitance, inductance and resistance (or impedance) are the primary factors involved in defining a cable’s performance and sound. The choices made by a cable designer, conductor type, dielectric, spacing, geometry and shielding, and how these are balanced, determine the cable’s sound. 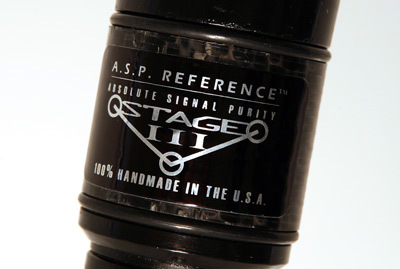 Stage III Concepts (hereinafter “Stage III”) has been designing and hand crafting audio cables with an attention to detail and build quality that is second to none since 1996. My initial experience with their cabling was the purchase of one of their “Heighliner” power cords about eight years ago. At the time it represented the top of their AC product line. 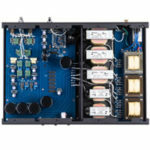 Its massive conductor array and extremely low resistance made it a natural partner for high powered transistor amplifiers, while its ability to lower the noise floor and deal with EMI and RFI also made it an excellent choice for line level and source components. Not surprisingly, the Heighliner has since been bettered, but never embarrassed. During the intervening period, Stage III has further refined their technology. The result of that effort is the A.S.P. Reference Zyklop power cable (hereinafter the “Zyklop”). The Zyklop utilizes flat, solid core, pure silver wire whose edges have been carefully tapered to reduce the portion of the wire that comes in contact with the insulating tube in which the ribbons are mounted. The conductors are made exclusively for Stage III using an ultra-slow, temperature-controlled wire extrusion process that minimizes crystal grain boundaries and stresses within the metal. After extrusion, they are subjected to controlled cryogenic treatment, where a temperature of -300 F is maintained for 48 hours. All other connectors and terminations undergo the same cryogenic tempering process. The ZYKLOP employs 8 palladium/silver alloy AeroStrand Ultra™ conductors (2.5mm x 0.55mm) for each polarity in a tubular helix geometry which utilizes an air dielectric with FEP Teflon air-tubes. The massive conductor array allows this unique cable to have extremely low resistance. The plus/minus twisted pair geometry is very effective in reducing induced noise and lowers both capacitance and strand interaction. The cables are shielded from outside interference with a proprietary foil plus nickel plated copper braid, with individually protected ground, positive and negative conductors. The construction is multi-layer with a silica/ceramic/ferrite mechanical damping/shielding layer. The shield is never used as a signal conductor. The Zyklop is terminated with dual cryo treated Furutech AC and IEC plugs with pure copper/gold contacts housed in custom handmade carbon fiber plug assemblies. 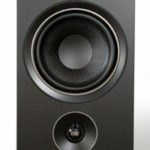 The Zyklop was subjected to a fairly lengthy break-in on a cable cooker prior to any listening tests; thereafter, it was installed in my reference system at various points in place of a power cord which I normally use and with which I am intimately familiar. 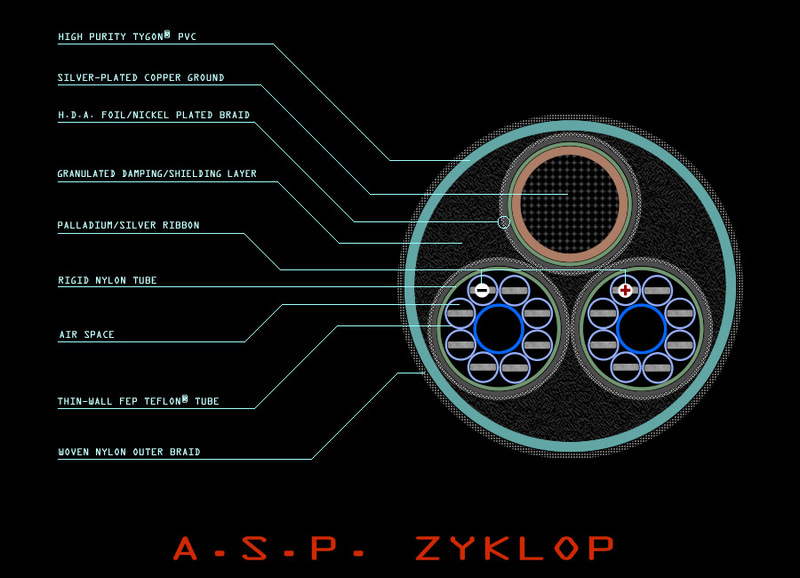 Once I had familiarized myself with the sound in my system, I moved the Zyklop to a second system owned by local audiophiles where with a small number of friends, I proceeded to compare the Zyklop to a number of other well respected AC cables. the substitution of the power cord since it fed a device powering all the front-end components required that the system be powered down, at least momentarily, each time a different power cord was introduced . As time passed, we did get more adept at making quick switches. In the end, after we had identified the two top cords, we allowed each about an hour of warm up in the system before doing our final listening to each. In one instance, we went out for dinner. Although a number of different CD’s were played during the listening sessions, the following software provided the primary basis for comparison: (1) Miles Davis: The New Miles Davis Quintet (DCC 24 Karat Gold G2S-1100, cut 3, “How am I to Know”), (2) Elton John: Honky Chateau (SACD Island Records, title cut), and (3) King Crimson, Lark’s Tongues in Aspic (HDCD, DMG 0505, 30th anniversary remaster, Simon Hayworth 2000). 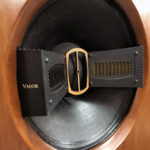 The power cords compared included the Black Sound Violet with Oyaide connectors, the Isoclean Super Focus, Acrolink Mexcel DA 7100, the Stage III Heighliner, Nordost Brahma, Nordost Valhalla, and A.S.P. Reference Zyklop. While there are various ways to present the data in the listening tests, it seemed most instructive to talk about a single cut and how each conductor, when inserted into the system, altered the sound of that recording. Starting with the Miles Davis, the BSV focused on the horn and cymbals to the detriment of the other instruments played. It really was unclear why Steve Hoffman had taken the time to master this cut as nothing seemed exceptional. With the insertion of the Isoclean, the horn became much clearer, the piano more focused and the cymbals had much more energy. Depth was much better. It now became clear that there was a double bass playing on the left. The piano was now much clearer and tonally more accurate. This now sounded like a SACD or a really well recorded CD. 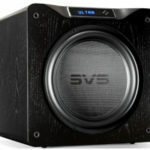 With the BSV the sound had been thin and tinny in comparison; there was now more air and sense of space. In comparison, the BSV sounded muffled, far away and small. It was now clear that the musicians were far back on the stage. Switching to the Mexcel, the cymbals were clean and not bright, the horn was very clear but could get edgy as the music got loud. The double bass and piano were audible in the mix. This cord brought the sound stage forward and flattened depth. There was some loss of dynamics. Switching to the Nordost Brahma, the cymbals and brush work were particularly nice but the trumpet was a bit thin (nasty when over driven) and the piano was down in the mix. The double bass was much less prominent. The trumpet could be piercing. The Valhalla was a distinct improvement with significantly more air and definition at the top. The tendency toward stridency when the horn got really loud with the Brahma was totally eliminated. The double bass was up in level but still not right. The trumpet was spatially forward of the other instruments. Dynamics were much better also. In summary the Valhalla was a rather significant improvement over the Brahma but still not right. At this point, we moved to what I like to think of as the “heavy hitters”. Cymbals and drum on the Heighliner were excellent with a nice sense of space and air. The energy of the horn was forcefully communicated but its sound was never harsh or strident. The saxophone was no longer lost in the mix and was richer tonally than with the Nordosts or Mexcel. The piano was nice, better in balance with the other instruments. Bass appeared to go lower with more authority. The sound of the drum being struck was more complex. You heard not only the head but also the contribution of the cavity. As good as the Heighliner was, the Zyklop was even better. Stage height was greater, more suggestive of what one would hear sitting in the audience. The sound of the horn had greater harmonic complexity. The double bass was more present. The saxophone was good but not quite as rich as with the Isoclean. Bass was even better defined. All instruments were well balanced with respect to each other with none (other than the horn) predominating. Again, you heard not only the drum head but the cavity resonance. The mid bass was particularly good. In comparison to the Isoclean, the piano was not quite as rich nor did it have quite the substance, or sense of woodiness. Again, in comparison to the Isoclean, the Zyklop had more energy at the top without being either bright or edgy. - 8 palladium/silver alloy AeroStrand Ultra™ conductors (2.5mm x 0.55mm) for each polarity in a tubular helix geometry. - Air dielectric with FEP Teflon air-tubes. - Exclusive H.D.A. (High Density Alloy) foil plus nickel plated copper braid, with individually protected ground, positive and negative conductors. - Multi-layer construction with silica/ceramic/ferrite mechanical damping/shielding layer. - Custom hand made carbon fiber plug housings. - Furutech AC and IEC plugs with pure copper/gold contacts.